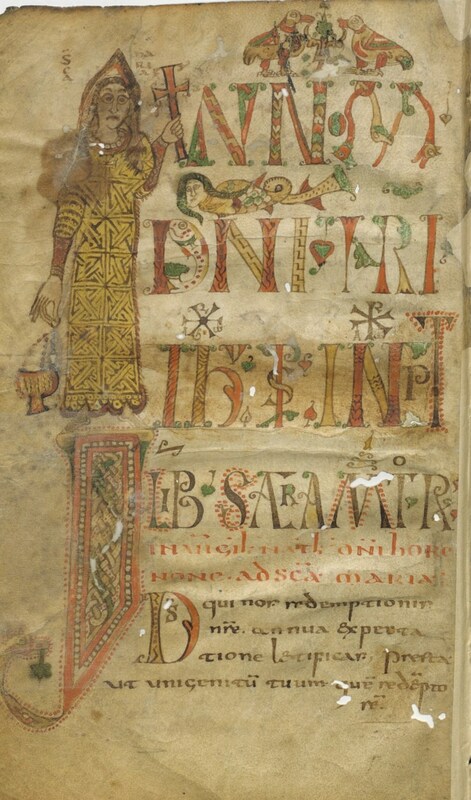 One of my favorite manuscripts for illustrating articles on liturgical history is the Gellone Sacramentary, a work of the end of the 8th century; its precise origin is unknown, but many scholars think it was copied out in a monastery in the vicinity of Meaux in northern France. The title “Gellone“ comes from St William of Gellone, who may have received the manuscript from his cousin Charlemagne, and later donated it to an abbey which he founded, Saint-Guilhem-le-Désert. From there it passed to the abbey of St Germain-des-Prés in Paris, and is now in the Bibliothèque National de France, (Département des Manuscrits, Latin 12048); it can be seen and downloaded for free from their website. The first half of the manuscript has an enormous number of decorations, which show an extraordinary degree of variety and inventiveness; there are far fewer in the second half. Here is just a selection of some of the more interesting ones. 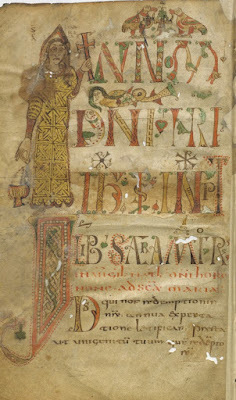 The title page (folio 1v): “In the name of Our Lord Jesus Christ, here begins the Sacramentary. On the vigil of Christmas, at the hour of None, the station at St Mary Major,” followed by the collect of the vigil of Christmas. In this period, Christmas Eve was considered the beginning of the liturgical year, and Advent comes at the end of the book. The Virgin Mary is shown holding a cross and a thurible. The prayers of the feasts of St Stephan and St John (folio 6v). Very often, there is no obvious connection between the decorations and the liturgical text. The prayers of Ash Wednesday and the following Thursday; the station of the latter is at the church of St George, whose name is spelled as “Iorgium” (folio 23v). Another part of the baptismal rituals of Lent, in which four Gospels were read to the catechumens, one from each Evangelist, followed by a catechetical lesson. The figures on this page are the symbols of Ss Matthew and Mark (folio 42r), with Ss Luke and John on the next page (42v). The conclusion of the Holy Thursday Mass for the Reconciliation of the Public Penitents, and the beginning of the Chrism Mass (folio 50v). Part of the Solemn Prayers of Good Friday (folio 54v). The text of the Exsultet (folio 58r). The Prayers for the last two prophecies of the Easter vigil, and the beginning of the blessing of the baptismal font (folio 60v). The end of the Preface, the Sanctus (written in Greek letters), and the beginning of the Canon. (folio 143v).